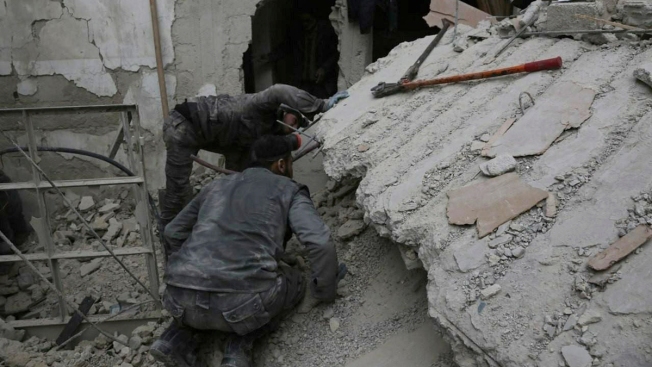 In this file photo released on Wednesday Feb. 21, 2018 which provided by the Syrian Civil Defense group known as the White Helmets, shows a member of the Syrian Civil Defense group, searches for victims under the rubble of a destroyed house that attacked by Syrian government forces airstrike, in Ghouta, a suburb of Damascus, Syria. U.S. officials say the United States is finalizing plans to evacuate several hundred Syrian civil defense workers and their families from southwest Syria as Russian-backed government forces close in on the area. U.S., Britain and Canada are spearheading the evacuation that would transport members of the White Helmets group to transit camps in neighboring countries. From there, they will be sent to countries in Europe and possibly Canada. The U.S., Britain and Canada are spearheading the evacuation that would transport members of the White Helmets to camps in other nations. Officials say the operation appears to be imminent as the Syrian army continues to gain ground in its latest offensive. The White Helmets have received backing from the U.S. and other Western nations for years. U.S. officials say the United States is finalizing plans to evacuate several hundred Syrian civil defense workers and their families from southwest Syria as Russian-backed government forces close in on the area. "These are hard hours and minutes," the White Helmets volunteer in Quneitra said, speaking on condition of anonymity for fear for his life. "This is the worst day of my life. I hope they rescue us before it is too late."